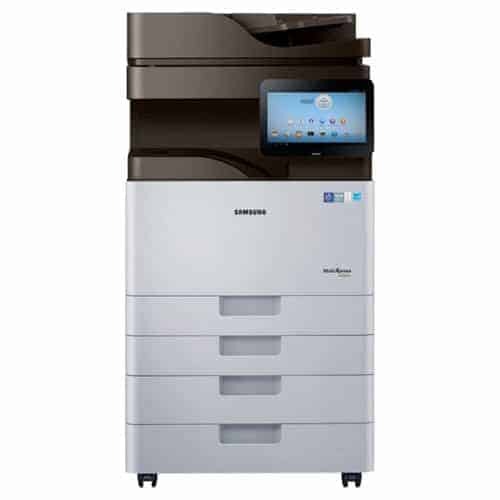 Samsung K4350LX Monochrome Multifunction MultiXpress - Perfecta Business Services, Inc.
With a focus on boosting productivity and efficiency through innovative technology, Samsung offers differentiated products and solutions. The MultiXpress K4350LX/K4300LX/K4250LX MFPs, for example, incorporate a world-first Android operating system. It’s innovations like this that have led to our A4 laser printers earning the No. 2 position in global market share, while our A3 MFPs continue their strong growth. The unique Android-based interface offers the ease of a touchscreen display, along with access to hundreds of productivity-enhancing apps. The MultiXpress K4 Series MFPs provide simple, innovative usability through the Samsung SMART UX Center, the very first Android printing User Interface (UI). These user-friendly interfaces provide intuitiveness, usability and extensibility. To speed workflow and simplify use, administrators can create custom shortcuts directly on the device. Users can instantly perform complex tasks with one click.